Boards are over, it feels like summertime in New York, and I couldn’t be more excited! There are so many fun things coming up for me in the next month – plans to check more things off our NYC bucket list, a trip to Seattle with my co-residents, a bachelorette party in Miami, and one of my best friend’s wedding in Chicago. It’s a busy time of year, but with so much celebration and happiness going on, it’s certainly a welcome change to the harshness of winter. I made these homemade marshmallows and graham crackers a few months ago, but I was waiting for the weather to warm up before sharing the recipe. Because let’s be honest, s’mores are definitely best enjoyed on summer evenings by a fire! 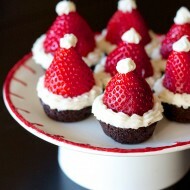 Or if you’re me, they’re also pretty good to make for a bachelorette party being hosted in a house with a fire pit! I made these to be enjoyed at my friend Marissa‘s bachelorette party in Florida a few months ago since I thought s’mores would be a really fun party treat. For Marissa’s engagement I made cookie butter rice krispie rings, so I figured I’d keep the theme going and make my marshmallows cookie butter-flavored also. 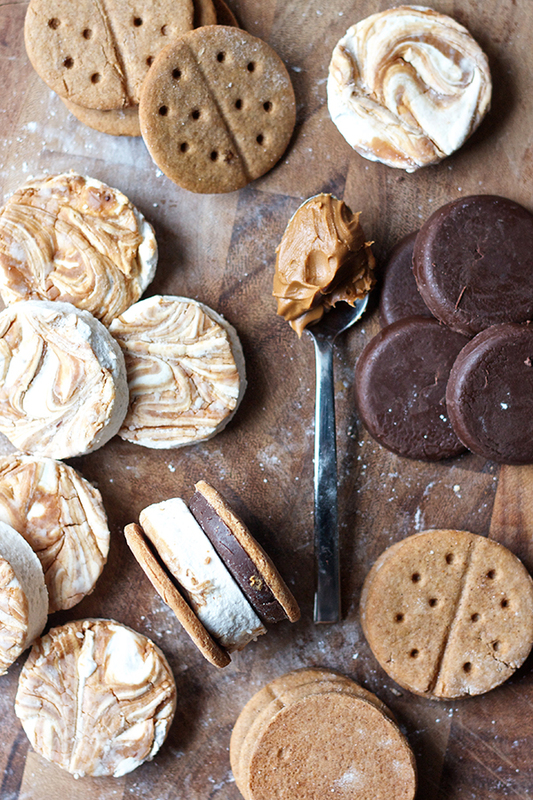 I took these special s’mores one step further and made the graham crackers from scratch too. And since I’m a crazy person, I made a few disks of semisweet chocolate to match up perfectly with my circular marshmallows and graham crackers. I wanted to do a different shape than the standard square for the marshmallows and crackers because I figured if I was making them from scratch, might as well make them taste AND look special. I just used the same size round cookie cutter for the marshmallows and graham crackers and the chocolate disks were made by pouring melted chocolate into greased muffin tins. The perfectionist in me loved how the sizes all matched! I’ve made homemade marshmallows once before, and I was excited to try my luck at them once again. They are truly magical to make – what starts out as a small amount of clear mixture turns into mounds of the most amazingly fluffy and pearlescent white marshmallow. Transferring it to a prepared pan and cutting out the shapes can get a bit messy, but I’m used to having most of my kitchen covered in powdered sugar anyway. Last time I made them by spiking the mixture with some Kahlua, but this time around I waited until after the marshmallow mixture was made, then swirled in some melted cookie butter. This way you can really see the cookie butter and it adds a pretty swirl as well. Pretty, or weirdly bumpy, but it’s something about how the marshmallow sets up next to the swirled in cookie butter that made it look a little wrinkly. While I would have loved for them to come out perfectly smooth on top, I LOVED the taste of the cookie butter in these, and let’s face it – they’re destined to become an ooey-gooey mess as a s’more soon enough and at that point no one will notice…. The graham crackers were fun to make – very similar to a roll-out cookie dough, but with the quintessential spice of graham flour and brown sugar. I baked my first batch a few extra minutes so they were a bit crispier than your store-bought cracker, so just keep an eye out on yours if you want a softer bite to them. 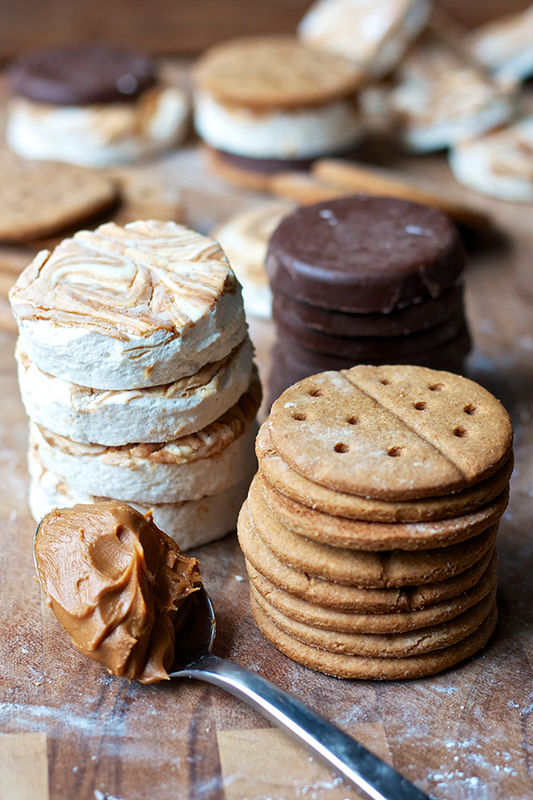 The taste is really so much better than the store-bought variety – there’s just tons more flavor and they’re pretty being round too :) I had to put in the little indentations so they really looked like graham crackers, and I’m not really sure I can even go back to eating normal s’mores again. 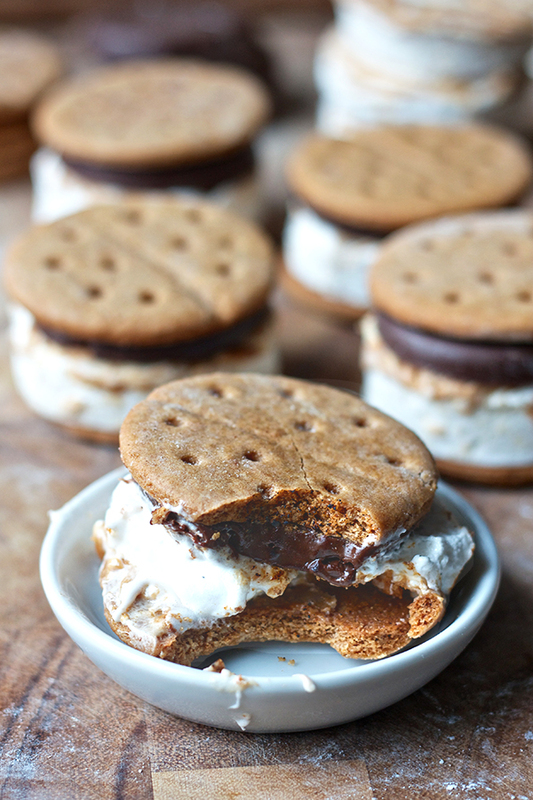 Ha ha, just kidding – you’ll never have to twist my arm to eat any variety of s’mores. But if you want to add a smear of cookie butter to your next s’more, even if it’s all store-bought, I’m telling you you won’t be disappointed! Place 1/2 cup of the water in the bowl of a stand mixer fit with a whisk attachment and sprinkle the gelatin over. While the gelatin is softening, in a small saucepan fit with a candy thermometer, combine the remaining 1/2 cup water, sugar, corn syrup, vanilla extract, and salt. Heat over medium until the mixture reaches 240 degrees. Start the mixer on low speed, and slowly add the syrup to the bowl. Increase the speed to high and whip until the mixture is very thick with stiff peaks, about 10 minutes. In a small bowl, combine the powdered sugar and cornstarch and whisk together. Lightly grease a 9x13" pan and coat the sides and bottom well with some of the sugar/cornstarch mixture. 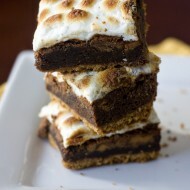 Use a lightly greased spatula to spread an even layer of the marshmallow mixture in the prepared pan. Put the cookie butter in a microwave-safe bowl and heat for 30 seconds. 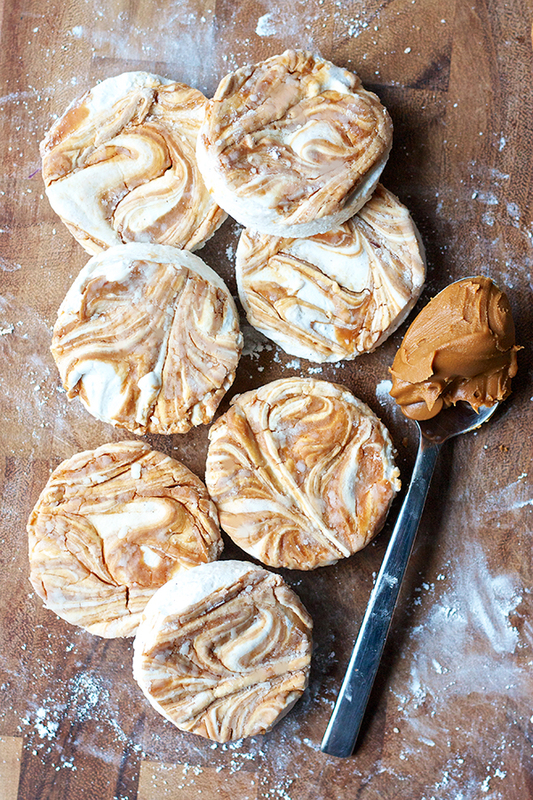 Dollop the cookie butter on top of the marshmallow and use a knife or toothpick to swirl the cookie butter in. Sprinkle some more of the remaining sugar/cornstarch on top and allow marshmallows to set for at least 4 hours uncovered. Once the marshmallows have set, transfer them to a cutting board. 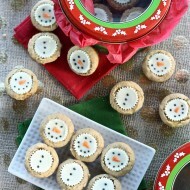 Use a cookie cutter to cut desired shapes (dip the cookie cutter in powdered sugar to prevent sticking), or use a sharp knife to cut squares. Store in an airtight container until ready to use, adding in the rest of the sugar/cornstarch mixture and tossing to help prevent them sticking together. In the bowl of a food processor, combine flours, brown sugar, baking soda and salt and pulse to blend. Add the butter and pulse in short bursts until the mixture has the texture of coarse meal. In a small bowl, whisk together the honey, milk and vanilla. Add the liquid to the flour mixture and process just until a dough comes together. Wrap the dough in plastic wrap and chill for at least 2 hours. When the dough is chilled, line baking sheets with parchment paper or Silpat mats and generously flour your work surface. 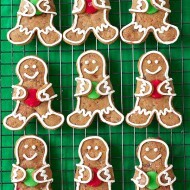 Roll out the dough about 1/8" thick and use the same cookie cutter you used for the marshmallows to cut out shapes. Re-flour the surface and re-roll your dough as necessary. Transfer the cut-outs to the prepared pans and chill them again in the fridge for another 30 minutes, or in the freezer for 15. Once chilled, preheat the oven to 350 degrees. 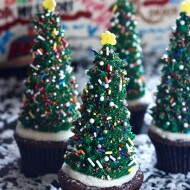 If desired, use the blunt end of a wooden skewer or lollipop stick to poke a dotted pattern in the top of the crackers. Bake until evenly browned and just crisp, about 15-17 minutes total (I would err on the side of 15 minutes so they don't turn out too crunchy!). Let the crackers cool on the pans for 5 minutes transferring to a wire rack to cool completely. 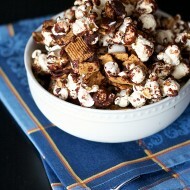 Store in an airtight container until you're ready to make your s'mores. If you're crazy like me and want to make chocolate disks for your s'mores, find a muffin tin that is about the same size as the cookie cutter you used for your marshmallows and graham crackers. Spray lightly with nonstick spray. 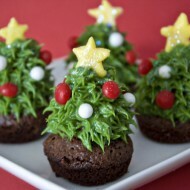 Melt the chocolate in the microwave in 30 second intervals, stirring well between each interval, until completely smooth. Pour about 1/4" of chocolate into each well and transfer to the fridge to let the chocolate set. Once the chocolate is firm, use an offset spatula or paring knife to help pry the chocolate from sides of the tin and wipe off any excess oil. Oh god yes. I have made peanut butter marshmallows before but I used them served with peanut butter hot chocolate. Time to bust out the cookie butter! I’ve always wanted to make my own graham crackers too. Seattle!! When? for how long?? I’ll send you an email with places you have to go to! Yes, I have a conference there over Memorial Day weekend! Please let me know any recommendations you have, thanks Farhana!! 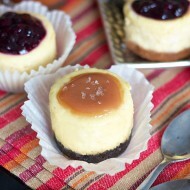 erica – these look AMAZING! one question – how did you heat up the marshmallows to make your s’mores… (with the odd shape and all…)? My smore creams have kicked in! 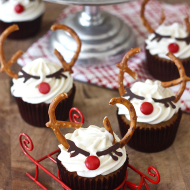 These look epic.. and I love cookie butter so I have to make them. Those are incredible, love the homemade grahams and marshmallows. Is cookie butter Biscoff? Yes, cookie butter is Biscoff spread too!